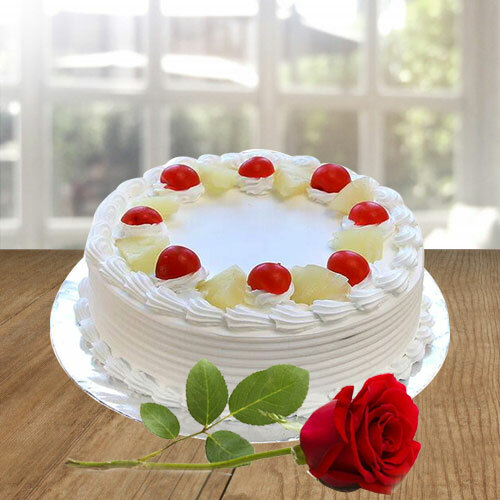 Win the mind and heart of your dearest person by gifting this Exquisite 1 Lb Vanilla Cake and a Fresh Red Rose. 2.2 Lbs Vanilla Cake with Single rose.A lip smacking and delicious freshly baked vanilla flavored cake which is beautifully garnished with tasty delicacies and toppings along with a single Rose to add a touch of speciality to the gift.The cake is hand delivered to ensure freshness. 4.4 Lbs Vanilla Cake with Single rose.A lip smacking and delicious freshly baked vanilla flavored cake which is beautifully garnished with tasty delicacies and toppings along with a single Rose to add a touch of speciality to the gift.The cake is hand delivered to ensure freshness.